Music Festival Reviews | The MF 2012 Bonnaroo Festival Lineup Is Out! 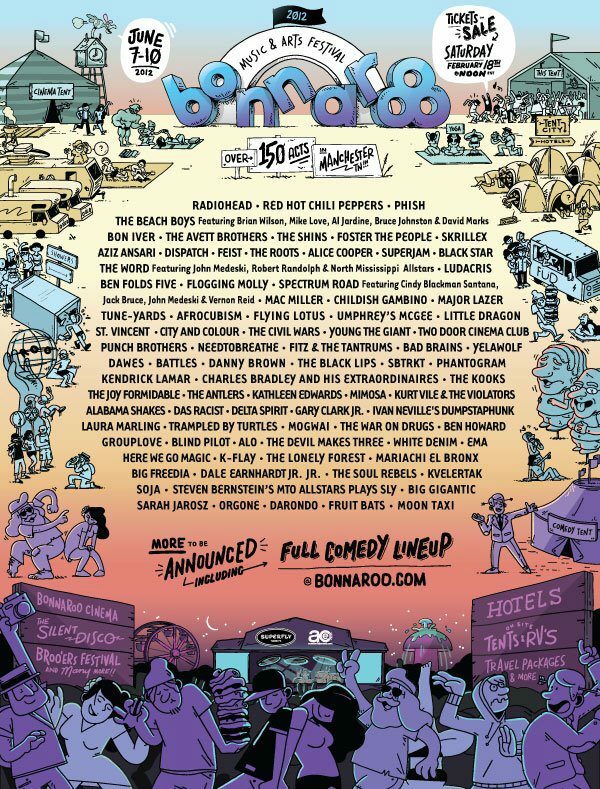 The MF 2012 Bonnaroo Festival Lineup Is Out! With the Headliners Radiohead, Red Hot Chili Peppers, Phish and the Beach Boys they covered a LOT of ground. You probably REALLY like one of those bands but not more than two. I just heard Childish Gambino for the first time last night. Did you know that’s the funny black guy from Community? You think he would sound like nerdy math rap but he actually sounds more like Ludacris… who will be at Bonnaroo. Das Racist, Black Star, Major Lazer, Big Freedia will be there for the hip hop heads. Scrillex is worth mentioning. The Black Lips are there for dirty pop punk rockers. They are like a drunk, profane new version of the Beach Boys. Wouldn’t that be nice to see together. Delta Spirit, Dale Earnhart Jr. Jr., The Avett Brothers and Bon Iver are going to be on my list this year. But that’s just me. I like folk, punk and gangster rap. You little whippy snappies probably know more about music than me anyways. Who else should I go see?